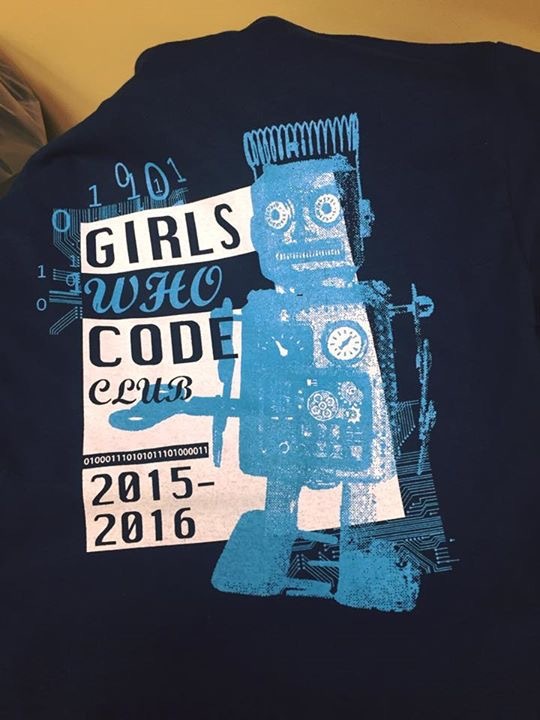 I created this retro shirt design for a Murray, Kentucky based programming club. 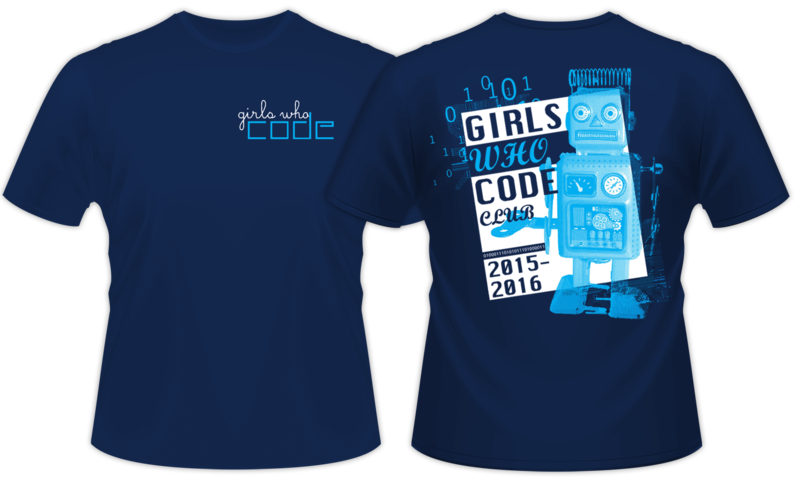 Since the organizer loved my shirt design for her previous group “Women in Computing“, she reached out to me once again. Since she asked for housewives from vintage ads on pink shirts, that design was decidedly more “girly”. 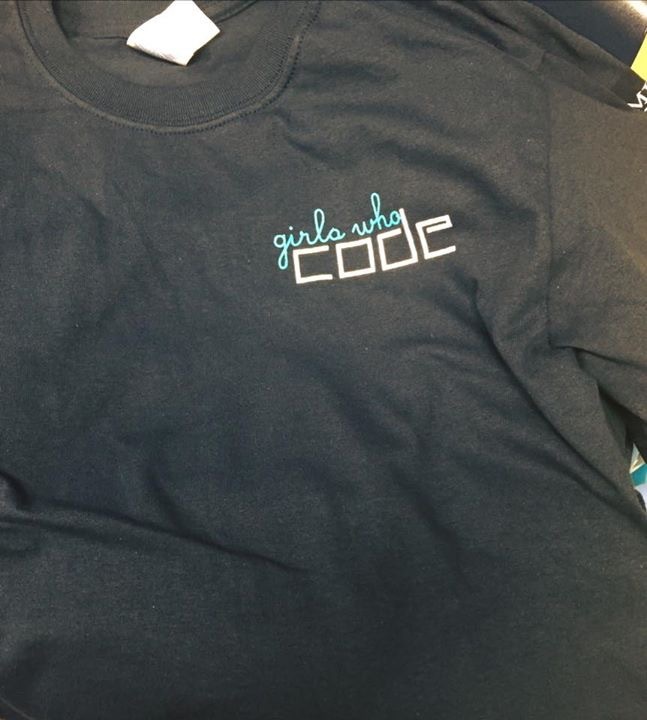 This time around, she wanted something less feminine, since there were also males helping with her new group “Girls Who Code”. She still wanted to continue our previous kitsch art theme, while keeping the “nerd” vibe going. Her only other requirements were for the design to be two ink colors screen printed on navy shirts. I was happy to comply. I excel at this format because many of my apparel clients stick with only one or two colors. My specs were on paper, so I got to work right away. First, I searched through my vast stock photography catalog. I quickly found a retro photograph of a wind-up robot that would obviously be a perfect fit. The robot’s colors were then simplified down to only cyan blue. Next, I overlaid it partially on both the white strips and the negative space. Thus, I added contrast. I then laid out the text in mixed “Chicago” and “MT Script” fonts to add to the fun. I tilted both the robot and text section at opposite angles, so I could give the art a little more movement. Therefore, it really jumps out at the viewer instead of a more conventional design. Finally, no coding related design would be complete without incorporating some ones and zeros. Thus, I had to top it off with a few. If you’re in a technology club looking for a shirt design that stands out, then contact me today!